McGreevy’s 5-Year Celebration on Thursday, 6/27/13! 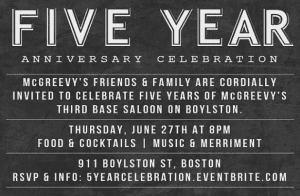 McGreevy’s on Boylston Street is celebrating their 5-Year Anniversary on Thursday, June 27, 2013 starting at 8pm! It is free to attend but RSVP here and get their early. There will be complimentary appetizers, pipes and drum performance, raffle prizes, cool swag, and more. 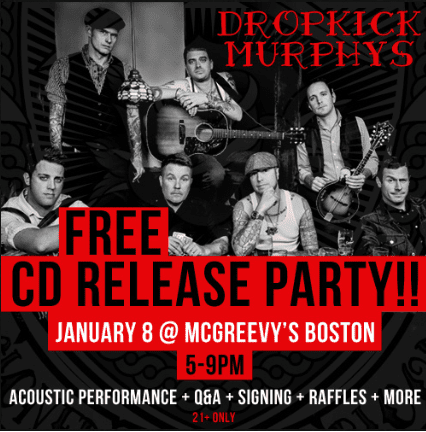 Today, January 7, 2013, Dropkick Murphys will be at McGreevy’s on Boylston Street for a FREE CD Release Party from 5-9pm. This is a 21+ event that includes a free acoustic performance, Q&A, autograph signing, raffle and more. Admission is free, but on a first-come, first-serve basis, so get there early if you want in. Thanks, BostonTweet for the heads up!